The Agilent E1439C (E1439D) is ideal for RF communication applications. Its 70 MHz IF input connects to common VHF/UHF and µwave tuners. This single-channel 95 MSa/s digitizer combines exceptional spurious-free dynamic range with alias-protection, signal conditioning, center-frequency tunable digital filtering, and a large signal capture memory. The only difference between the C and D versions is the E1439D includes a 2.5 Gbit/sec optical front panel data port and support for the VXI local bus. 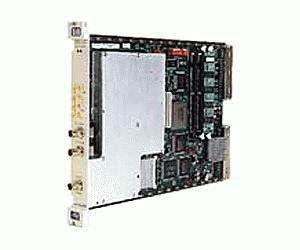 The E1439C (E1439D) is a single slot C-size VXI module. The E1439C/D delivers high sample linearity. Residual spurious signal contamination is at least –90 dBfs. Distortion is less than –62 dBc for full scale inputs and –70 dBc at lower levels. Noise density is –132 dBfs/Hz. The E1439D also incorporates a 200 MB/sec FPDP (Front Panel Data Port) capable of carrying full bandwidth data out of the module for analysis or storage.